DISCLAIMER: Just before you go on reading this post, please be aware that some photos featured in this article are graphic. Browsing the Internet about the most helpful and useful gadget out there for travelers I didn’t know I would end up writing this post! Seriously, it cracks me up seeing these things and I can’t help not to share this non-sense post about it but getting a good laugh from it may probably be a good reason to do it. It wasn’t my first time to see this online but I thought it would be really helpful for women travelling, especially in a long bus ride like border crossing that takes more than 10 hours most of the time. You know that sometimes it takes time to get to the ‘nearest’ gas station or local restaurant’s toilet, and that’s is quite painful. What about when they can just pull over and the male passengers can just whip out their ‘bells’, easily jingle it and alas! Done and relieved. FYI – The woman who invented it got the idea when she had the above mentioned problem while backpacking Europe! Would I use it? Honestly, if they’d send me one to review it, I’d do it. Who knows, it might be really helpful. Earlier generations have invented this by just sewing piece of cloth to their bras. It would be helpful when you’re always taking public transport during the rush hour, and just like our last weird travel tool it will do a good job hiding your small valuables. As much as I’m disgusted seeing this thing, I thought it was brilliant. It is very useful and the crap IS fake to function safely if you left your stash inside when you’re in a hotel or hostel. Nobody would want to touch a ‘filthy’ underwear laying around (I couldn’t even stand looking at it, let alone touch it. Eeeewwe!). Don’t tell me I didn’t warn you about the graphic photo but I think some of you can agree that these could be useful. 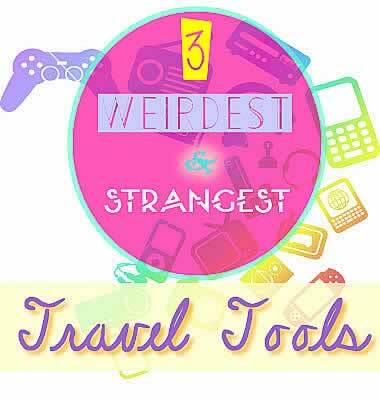 It is indeed, 3 Weirdest and (Possibly) Helpful Travel Tools I’ve come across out there at the ‘www’ and might be even more weird physically. Oh well, you tell me… What do you think?